TVXQ’s seventh album topped the music charts as soon as it was released. At noon on the 6th, TVXQ’s 7th album ‘TENSE’ was released, and its title track ‘Something’ has since topped the ranking charts of various online music sites like Olleh, Bugs and Genie, reflecting an explosive response for the song. ‘Something’ is a swing jazz piece that showcases a new side of TVXQ, and the duo made an explosive return on the major broadcasting companies’ music shows with complicated choreography and a high-quality performance. ‘Something’ was not the only track to succeed, with other tracks like ‘TEN (10 YEARS)’, ‘Me, Instead of Him (Beside)’ and ‘Tonight (Moonlight Fantasy)’ ranking high on the music charts as well. With the album topping the real-time album sales charts of various sites like Synnara and Hanteo, TVXQ proved once again that they are a force to be reckoned with as they dominated both digital music charts and album sales charts. 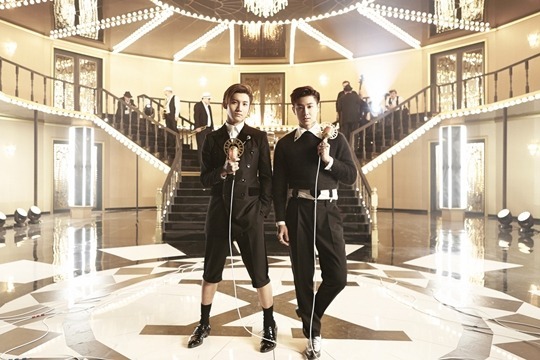 Meanwhile, TVXQ will be continuing their promotional activities for ‘Something’, appearing on Mnet’s ‘M! Countdown’ on the 9th, KBS’ ‘Music Bank’ on the 10th, MBC’s ‘Show! Music Core’ on the 11th and SBS’ ‘Inkigayo’ on the 12th.